With summer fast approaching, homeowners across Perth are getting ready to spend hot summer days by the pool. While summer brings in warmer days, extended hours of sunshine and school or work holidays, it also coincides with an increased risk of sun damage – both for your family and your pool. The sun’s UV rays can be incredibly harmful and damaging on bare skin, causing sunburn and even leading to cancerous moles and spots in more serious cases. Not only affecting your skin, your pool can also suffer damage due to strong UV rays. If you’re gearing up to enjoy the best of summer, make sure that your pool and outdoor area is adequately equipped. Consider investing in a pool shade sail or outdoor shades to limit the amount of UV exposure and to provide you and your family with a safe and comfortable refuge out of the sun. 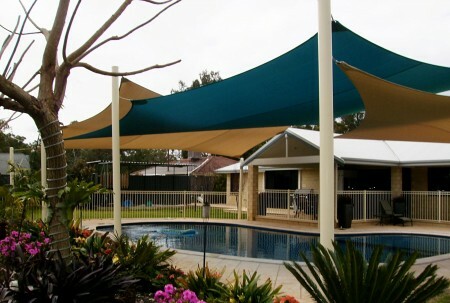 Affordable, efficient and quick to install, get prepared for summer with shade sails in Perth. Why Invest In a Pool Shade Sail? Hours spent in the sun quickly turn from fun and enjoyment to exhaustion and discomfort. With a pool shade sail, you can spend entire days outdoors without the adverse effects of sun damage on your health. You’ve invested in your pool, so why not make the most of it? 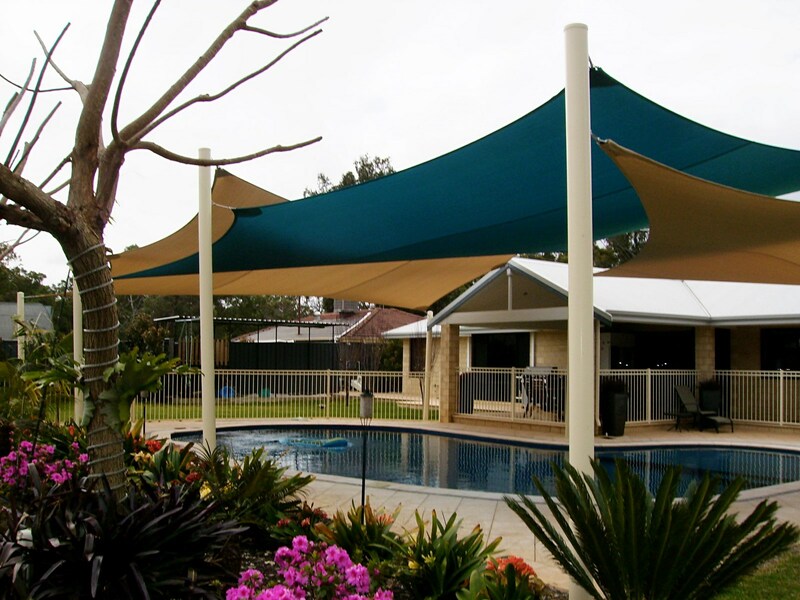 Here’s how pool shade sails help you and your family enjoy your pool throughout Perth’s hot summer days. Australia is renowned for having hot, sunny summers. With strong sun comes harmful UV rays that have the potential to wreak havoc on your skin and health. From minor sunburn through to the development of harmful and cancerous cells, excessive sun exposure can seriously impact your wellbeing. If you’re spending time outdoors or in the pool in summer, it’s essential to stay protected against the sun. While sunscreen is a must, it won’t provide the same level of protection and cover as a shade sail. With a pool shade sail, you substantially reduce the damaging potential of UV rays by creating a designated area free from direct sunlight. This allows you and your family to enjoy the warm weather, seek out the sun and relax in shady spots to get some relief. Not only damaging for your skin and health, UV rays can also impact the quality of your pool water. Pools are kept clean and hygienic thanks to a delicate balance of chemicals. But, when UV rays penetrate your pool, they cause chlorine to dissipate. Without a stabiliser, the desired level of chlorine can be lost within just a few hours thanks to the strong sun. With a pool shade sail, you extend the quality of your pool water by shielding it against UV rays. Water is a very precious resource, both for our environment and our bank accounts! Limiting the loss of water through evaporation can save you countless dollars over time. This can be helped simply by installing a shade sail above your pool or spa, saving water and therefore saving money! Getting ready for summer? Set your pool up for success with pool shade sails. At Shade Experience, we specialise in manufacturing, supplying and installing a full range of pool shade sails, garden sail shades and outdoor shade sails in Perth. Designed to protect you, your family and your pool from harmful UV rays, our shade sails are customised to suit your needs. Find out more about creating bespoke shade sails with our Perth professionals. Contact us on (08) 9417 9988.